Are you interested in pursuing a major in Economics? 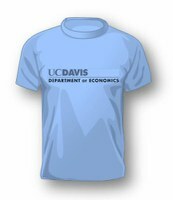 The curriculum of the UC Davis bachelor's program in Economics encompasses instruction in deductive reasoning and analysis of models to help understand economic theory, strategies, tactics, policies and consequences. At the same time, students are trained in modern methods of empirical and data analysis that are needed in the business and professional world. A 2010 survey of 1,072 economics majors at public and private colleges and universities by researcher Steven Jones and colleagues reported that 78 percent of majors were either satisfied (47 percent) or highly satisfied (31 percent) with economics as a major, and only 3 percent were dissatisfied. Asked what they derived from their studies in economics, an overwhelming majority of survey respondents (89 percent) said that they learned the economics way of thinking—a primary goal of the economics major. Are you interested in pursuing a minor in Economics? You have come to the right place! Our Economics and History Advising Center has several staff advisors that are available to assist you with various student services related to the major, including academic planning, petition review, course selection, career pathway development, and special study progress. You may email* the Economics staff advisors for questions or concerns.